wishing 2012 could be crucial! 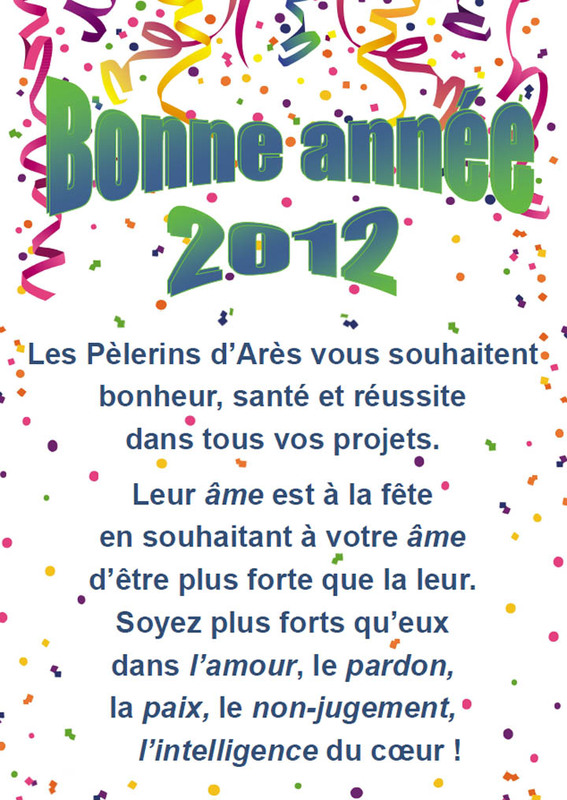 The Arès Pilgrims wish you happiness, good health and success in all your plans. Their souls are in happy mood in whishing your souls to be better than theirs. Does the man that wishes others to be better than him show futile humbleness? No, he shows strong realism. In days when man deludes himself about his true self and so is getting weaker and likelier to destroy himself, the time when he becomes aware of his sins and weaknesses is a great crucial lucid time, which contributes a lot to the change, therefore the salvation of the world<. We will not enter the night, we will not be destroyed, destroyed by sin, without struggling, without struggling with our sin thorugh penitence. This is why we strive to love, forgive, make peace, cultivate spiritual intelligence and be free from all prejudices, but if other people are more able to gain virtue and good than us, we can't help but rejoice. Good is a work of social salvation! What we Arès Pilgrims have got in additon, or in particular, is consciousness that the world is to be told that the Creator has spoken to it through The Revelation of Arès and insistently calls on it to change for the better through penitence. Join us! We need you.